• The Automatic Liquid manufacturing plant is designed to be operated only by one operator and one helper. • All material transfers are done by Vacuum or by Transfer Pumps. • All the Vessels are CGMP (Paint free Construction). • The Gaskets used are of Silicon (Food Grade). • All Contact parts are of S.S. 316 Quality material (SS304 provided on demand) & Finished to mirror finish and crevice free. • The entry of Stirrer & High Speed Emulsifier are from top. In-Line Emulsifier (As per customer choice) provided on Demand. (Optional in Liquid Manufacturing Plant). • All Vessels are suitable for internal pressure of 1 KG. / SQ. CM. and Hence can be Sterilized. • All Pipes, Pipe Fittings and Valves are of SS316 / Ss304 (As per customer requirement) Seamless Quality, Internally Electro Polished, with Tri-Clover Ended Joints. • Transfer pumps provided to Transfer ready product to filling line. • The Entire plant is Equipped with CIP & SIP Connection, so that customer can us this facility, If have CIP & SIP Equipment. • All Values of temperature & time of the plant are indicated digitally on the Controal Panel. Ampere indicates on Ampere Meters. (Automatic Liquid manufacturing Plant). 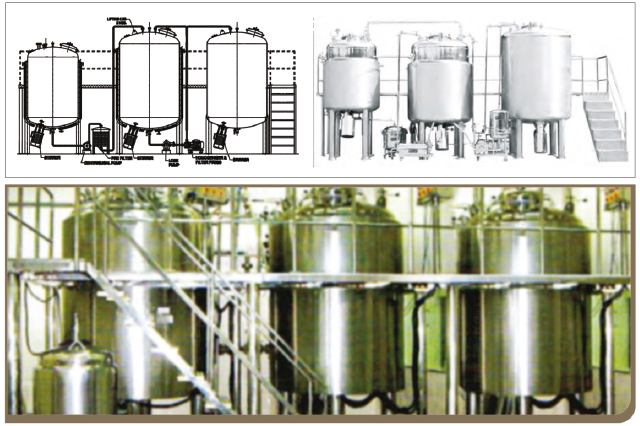 • A Micro processor Based Automatic operating Liquid Manufacturing Plant can be Designed as per Requirement (Optional). • All the Inlet & Outlet connections are provided with Tri Clover joints, which are very easy for cleaning & Replacement. Gala No.2, P.V.K. Compound, Laxmi Narayan Mandir Marg, Kherani Road, Sakinaka, Mumbai - 400 072, Maharashtra, India.